The monument will provide a location in the community for parents, grandparents, family members and friends to remember the children that have been lost. The Christmas Box Angel Statue was introduced to the world in the book The Christmas Box, a worldwide bestseller and hit television movie by author Richard Paul Evans. In the book, a woman mourns the loss of her child at the base of an angel monument. Though the story is mostly fiction, the angel monument once existed but is speculated to have been destroyed. 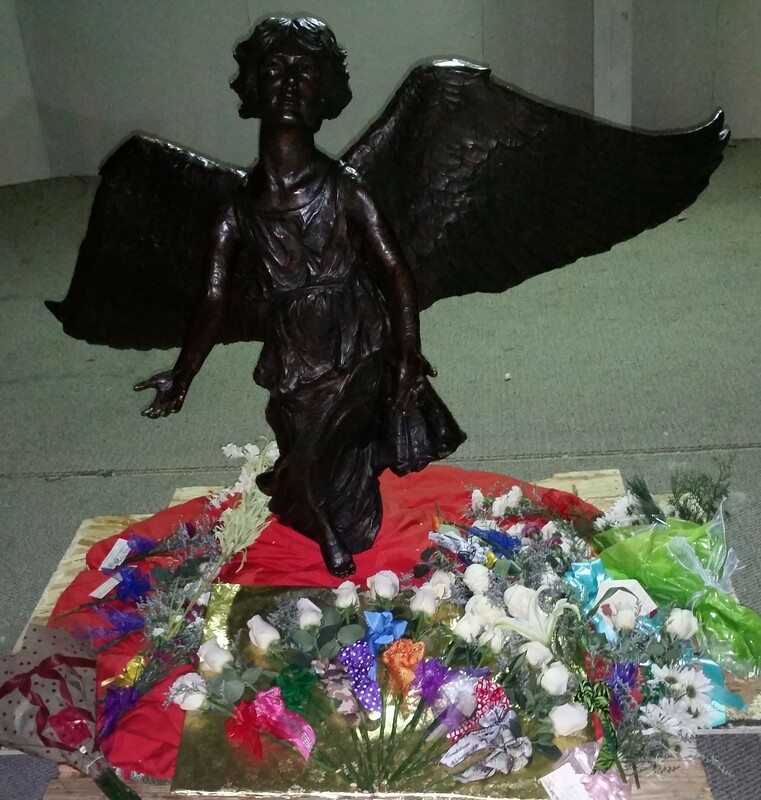 The new angel statue was commissioned by Richard Paul Evans, in response to reports that grieving parents were seeking out the angel as a place to grieve and heal. The monument was dedicated on December 6, 1994-corresponding with the date of the child’s death in The Christmas Box. (Coincidentally, Dec. 6th is celebrated in many parts of the world as Children’s Day). 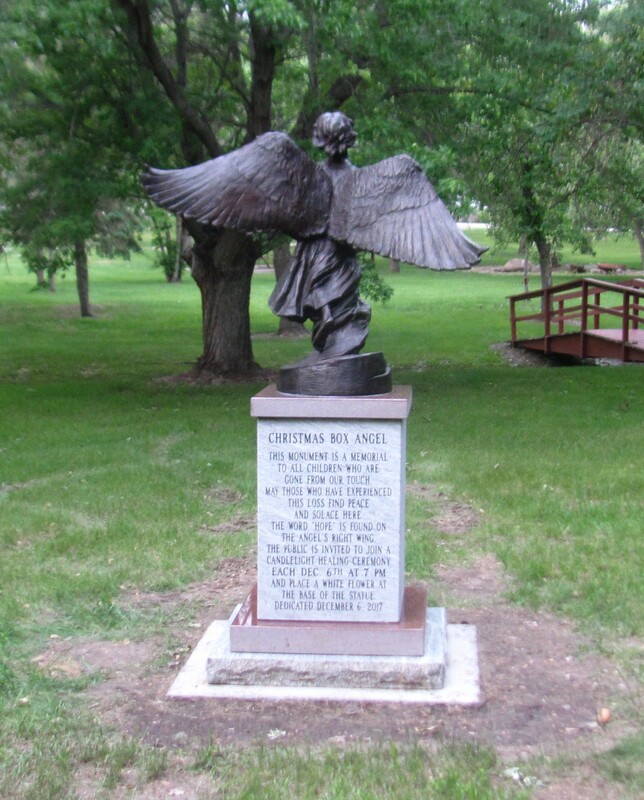 When will the Angel of Hope be placed at its location in Wilderness Park? ached, our goal would be by mid-May. What other improvements are planned for the Christmas Box Angel of Hope Memorial? Once the Angel is placed in the park, brick landscaping, lighting, benches, and possibly a path from the bridge are all items discussed. Will an Angel of Hope Ceremony be held each year? Yes, every year on December 6th from 7-8PM there will be a remembrance ceremony held. When will more information be made available on purchasing memory bricks? The Wilderness Park Committee will be meeting in January to start working on the design, size, and pirce for the paving bricks that will be available for purchase. While the bricks will be available for sale year around, they will only be placed twice a year by the monument company, Spring/ Fall. The engraving on the bricks will be up to the purchaser. The idea is that the brick would have something special on it, there will not be a requirement of what to put on the brick. More information will be available as the committee moves forward; any suggestions are welcome. Where can I find out more information about the Christmas Boxd Angel of Hope Memorial? How can I financially support the Christmas Box Angel Memorial Project? An account has been established at Garrison State Bank under "BLFG Christmas Box Angel", contributions can be given to any teller to deposit. For those persons who want to receive a receipt for tax purposes, their contribution should be made payable to BLFG Christmas Box Angel Project and mailed to BLFG, PO Box 445, Garrison, ND 58540 or dropped off at the Garrison CVB office (52 North Main St). What other improvements are planned for Wilderness Park? With the installation of the path, amentities for the path as well as learning centers are being discussed. Benches, dog waterer, lighted aerator, path lights, carved tree characters, native flower display, insulating the shelter are all items that have been discussed as well. These items are going to be prioritized with estimated costs and made public as some people already have indicated that they would like to sponsor them in honor or memory of a family member. Please contact one of the committee members below if you have ideas or would like to be notified of possible memorial or honor projects when made available. If I have further questions or suggestions, who is on the Wilderness Park Improvement Committee? Mike Matteson (337-6433, gsbair@rtc.coop), Jan Stroup, Tonya Graeber, Les Korgel, Paul Schlichting, Mike Youngs, Ron Krebsbach, Shannon Jeffers, Stu Merry, and Lindsay Bofenkamp.